Here at Golden West Exteriors, we are proud of the quality of our work. Our goal is to ensure that every single one of our customers are satisfied with their purchases. In order to do that consistently, we need to make sure that our customers are fully informed about their material options so that they can make the best decision for their needs as possible. When it comes to residential roofing in Edmonton and the surrounding areas, metal roofing proves to be a great material choice. 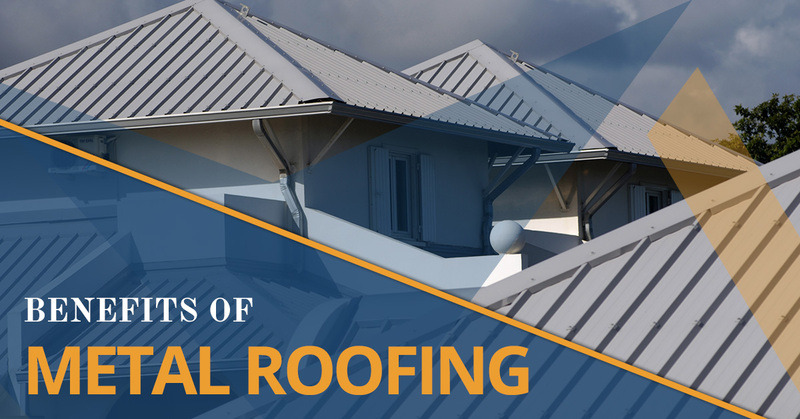 We go over the benefits of choosing metal roofing here. As far as long lasting material that can withstand many types of stress, probably no material can compete with metal for durability. This is especially true in colder climates, where even concrete can crack in the freeze/thaw cycles. The average asphalt roof, by far the most commonly found roofing material, will last only about 15 to 20 years before it needs to be replaced. However, metal roofs will typically last longer than a lifetime, and generally require much less maintenance than other roofing types to boot. It may seem counter intuitive that metal roofing materials would offer a wide range of style options, but they do just that. In fact, there is a metal roof for just about any architectural style that you can think of. In fact, metal roofing materials can be designed to look exactly like other roofing materials, like slate, shingle, tile, cedar shake, or standing seam. That means you can get the extreme durability of metal roofing, and still keep whatever style, pattern, and design you wanted for your home’s roof. That is a win win by any measure. Metal roofing can prove a greener option than other roofing types for a couple of reasons. One of which stems from their hardiness. Every year, over 20 billion pounds of asphalt roofing materials are dumped into landfills just in the United States alone. Because metal roofs only need to be replaced once every couple of lifetimes, if that, (about five times as long as asphalt, or more), waste from the material is greatly reduced. On top of that, metal roofing materials are made from about 56 percent recycled content, much more than asphalt and many other roofing materials. Metal roofs, unlike almost any other type of roofing material, have virtually no maintenance requirements. Sure, if there is ever any damage, you still need to take care of it promptly; however, other than semi regular inspections and repairs, a metal roof’s maintenance needs stop at a good hosing down for cleaning. This will save you lots of time and money that you would otherwise have to spend on less hardy roofing materials. Just do not forget to keep your gutters clean, as they are always a necessary part of a roof’s health! Often, home renovations can be tricky, especially if you are doing them to increase your home’s value. Installing metal roofing is one of the few renovations that has a high chance of increasing your home’s value. Prospective buyers will appreciate the lack of maintenance and repair they require, and will love not having to worry about its lifespan. Most metal roofs come with at least a 30 year warranty, often longer. Weight is a major factor with residential roofing. Ideally, you want as little as possible, so that structural movement does not cause any damage. Metal roofing is among the lowest weight roofing materials available on the market. In fact, they weigh so little, that they can sometimes be installed right over certain other roofing materials, like asphalt shingles. This reduces landfill waste, and saves the owner a lot of time, money, and hassle. Metal roofs naturally reflect some sunlight, which can reduce cooling costs in your home. On top of their natural reflective properties, they can be equipped with both reflective coatings and integrated thermal breaks. Altogether, metal roofs with these features can save as much as 20 percent on their home cooling costs. If fire safety is a consideration for your home, no roofing material can prevent house fires like metal roofing, which won’t ignite from airborne sparks or embers. Most metal roofs come with high level fire safety ratings. Like all roofing material options, there are always considerations to be made before deciding on a material. Metal roofing does tend to require a much larger upfront cost, even if the money is made up for over the course of its lifetime. That means it may not be the right choice for all homeowners. There is also a lengthier installation time to consider, as metal roofs require careful configuration to match the contours of your roof properly. Finally, owners should be forewarned that metal roofs can be loud when it rains. However, there are features that can be added to muffle the soundboard effect of a metal roof, making them comfortably quiet even in the rain. Have we piqued your interest about metal roofing? If you are looking for residential metal roofing in Edmonton or the surrounding areas, Golden West Exteriors can help! For more information about our roofing services, please do not hesitate to give us a call at your earliest convenience. One of our friendly and knowledgeable representatives will be happy to answer any questions that you may have.